Modern data centers face increasing demands for agile, high-performance service delivery as digital transformation drives an increasing number of new graphics intensive apps. 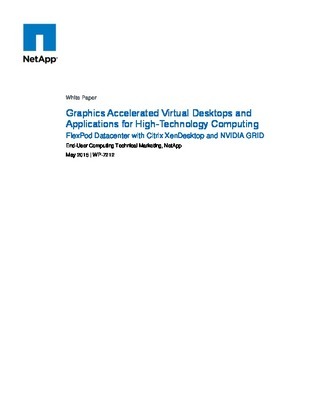 Jump into this white paper to learn how NetApp’s data center deployed with Citrix XenDesktop and NVIDIA Grid components can significantly enhance user experience, accelerate graphics visualization across virtual environments, simplify operations and lower costs. And, find out how this data center architecture can be flexibly sized to meet your specific requirements and tailored to your compute and GPU resources, storage, and network bandwidth to satisfy requirements.